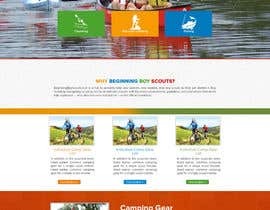 We need a simple friendly design that we can reuse for various webpages on a site that helps parents, new leaders, and youth understand Scouting. This job does not involve creating multiple pages nor generating any content -- we only need a template. The main content is written like blogs and many articles and news blurbs. The work may include HTML coding and CSS style creation. The main topics for the target audience are outdoor recreation (like backpacking, canoeing, camping, mountain climbing, biking, fishing, etc) and community service. The target age range varies, but mostly ages 11 to 18 and ages 30 to 60. The colors commonly associated with this are forest greens, khaki light brown, or other nature colors (but no camouflage), and USA colors - red white and blue. The website currently does not have a logo decided. The size of the css, html and images (if any) for a single page should be minimal (maybe a lot less than 1MB). If you would like sample content let me know. 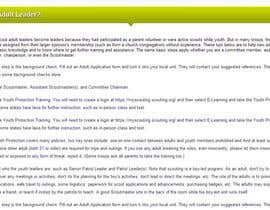 Some of the proposed sections or links include: home, about, ask a question, new to scouts? (maybe with drop down menu of types), archives, resources, and book. I can provide various nature photos if that style is considered by designer. #8 and #11 are good. But #8 image is too large. #11 image may be right size. I will provide outdoor photos that may be used. In my case I think I only want to columns for the articles -- one column for the content and one column for side content (advertisements, links, etc). I think for #8 I'd rather have nature or forest colors or Red/White/Blue *USA Eagle Patriotic" theme, Maybe try using a longer blog article in example (see my earlier content links). Thanks! I am happy to tweak the #8 design with you over a Skype call, with remote desktop so you can see the changes being made live. #1 is also copy of a website that already exists on the internet. I easily found it. Please don't copy an existing site and propose that. I rejected it. It had nothing to do with my project. Entry#16 : My entry is called Alive ! This has Sporty outlook fit for adventure and adrenaline rush. It is modern, highly customizable. This urges a sporting activity and is inviting to join. YA logo at the top stands for Youth Action. #16 is a copy of a website that already exists on the internet. I easily found it. Please don't copy an existing site and propose that. Examples should also include space used for banner and square advertisements. Should we work on this? 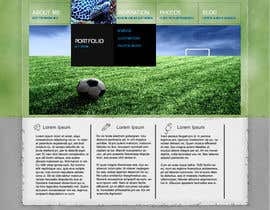 Do Not Worry.I just only saw this now.I will make you a website design.I am sure you will like it. 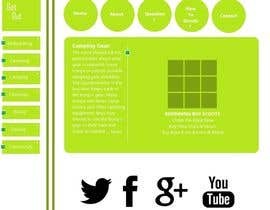 I have three templates which I wish to share with you. Sir, Please seal this project. So that we designers would be comfortable in sharing our best designs. Sorry I don't plan on losing more money on this freelancer.com contest. I misunderstood how it worked and as it is now I have lost over US$200 for no valid designs. Hi Reed, I can understand the issue. This is not a general trend on freelancer. But you need to understand that why would someone share best of his/her designs on a public platform, leaving it open for others to copy their designs. Lot of people have been copying designs here. Therefore if you bid high and guarantee & seal the project then you can expect very good designs. Your bid is already fairly priced and guaranteed. You are just one step away. I would suggest that you seal the project and extent the deadline by few days. I am sure that you will get very good designs from all of us. hi wait for my entry i will submit soon. I was told by Freelancer.com Support that the bogus entries will share the prize money if none is awarded. This is dishonest and misleading. The three entries as of this date are: two images that have no representation of a website and the third entry is a screenshot of an existing real world website (I easily found via google on the first page of search results). Is this normal for these contests? So anyone can submit any graphic and get a share of the money? As a workaround is it okay to for me to invite someone I know to submit a bogus image so I can award money to them (simply because I know them)? hi wait for my entry. i submit as soon as possible. I have two entries that have no relation to the desired job description. Is this because they share in the prize money if I don't select anyone? Is this common for freelancer.com contests to have bogus entries so they can share the money? I can manage what you are asking, I just need more information like a sample template as you said. Let me know, it will take for me 2-3 days. any website you are inspired of ? Please let me know. Please provide some sample content. The website's Public Clarification Board was broken for a few days and I couldn't see any of the messages until today(even though I had 4 Msgs.